November 8, 2011— I’m kind of partial to oaks because of my last name, to weeping willows because I find the idea of depressed trees both profound and hilarious, and to birches, since I live in New Hampshire. However, all it took was a few hours in the Redwood National and State Parks for me to hate every single tree on the East Coast. 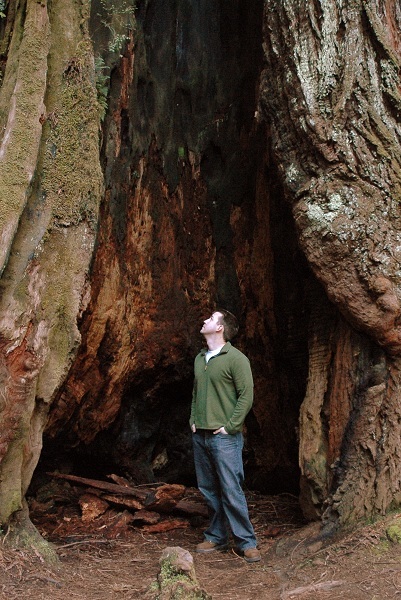 I mean, redwoods….those trees… those sky-spearing, transcendent, prosaically named giants. 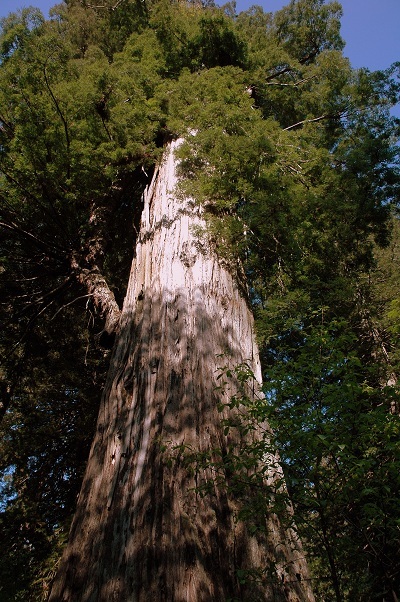 They’re the tallest trees in the world, soaring up to some 380 feet, are as wide as 26 feet, and live up to two millennia. Walking among them makes you feel as if your senses aren’t working properly. Like everything you thought you knew about the Earth was wrong. Like you’ve been shifted into a prehistoric age or warped into a dimension of crazy geometry or transported to an alien planet. Like, I don’t know, the forest moon of Endor. 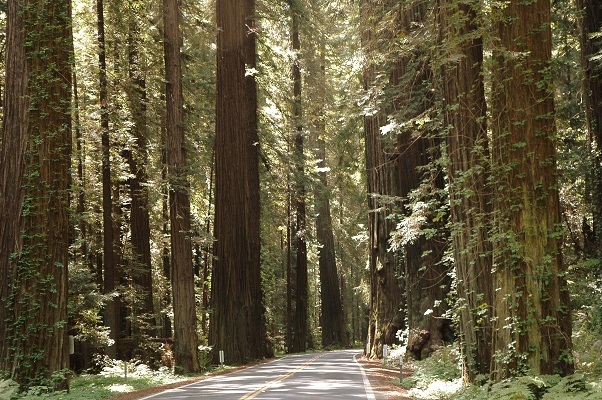 Coast redwoods (Sequoia sempervirens) stretch along more than half the coast of California, from the border all the way past Monterrey, as well as fizzing over into southern Oregon. 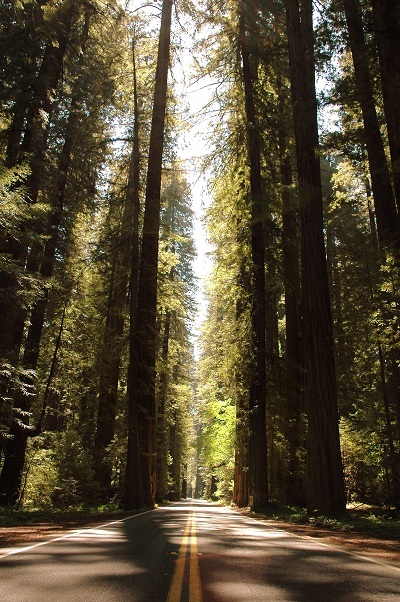 However, almost half of them are found in Redwood National and State Parks (RSNP), a unified collective of state and national parks located right at the northern border of California, and stretching down some 60 miles of its coast. 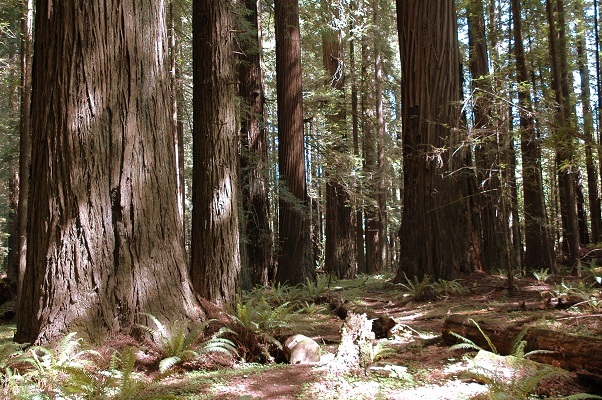 The individual but contiguous forests included the state parks of Del Norte, Jedediah Smith, and Prairie Creek, and Redwood National Park itself squares up the four. All told, the parks make up 133,000 acres of these plant high-rises, a small area compared to the rest of California’s national forests, but which could still hold their own in an all-out tree war. And you know what? That’s some good factual information, but who cares about facts when you’re encountering these vegetable behemoths. I mean, they make you rethink what it means to be a dominant species on this planet, make you wonder whether you really are the lucky one for being born on the animal side of the equation. They make you feel dwarfed, no matter who you are. Like you’re some kind of, I don’t know, Ewok. Now, this is the necessary part of any article about redwoods where we have to contrast them against their cousins the sequoias, because it’s easy to confuse the two. 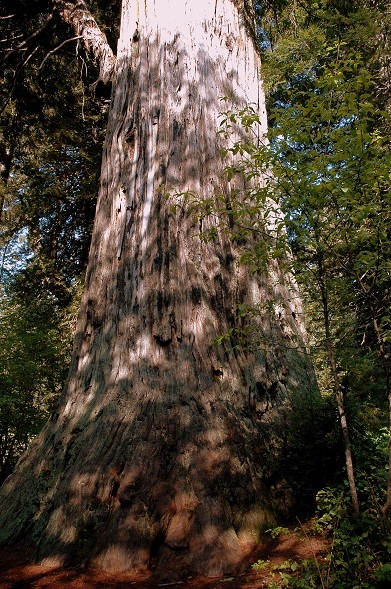 Both coast redwoods and giant sequoias (Sequoiadendron gigantean) are in the redwood family and both are located almost exclusively in California (with sequoias being found in the Sierra Nevada Mountains), but the trees represent different species. 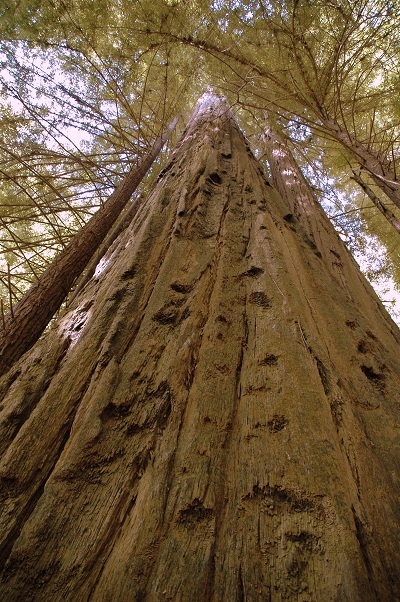 If you ever run into both of them at a cocktail party and have to tell them apart, redwoods are generally the taller of the two, while sequoias are broader (sequoias reach heights of 275 feet and widths of 40 feet). 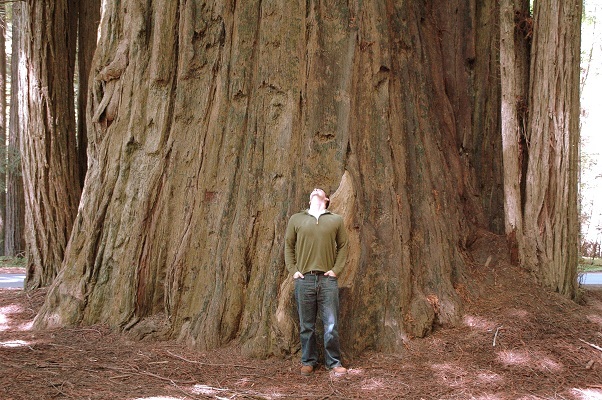 Of course, not as broad as a sequoia is still freaking broad, although I must admit that I’ve not yet had the pleasure of experiencing a sequoia firsthand. I should probably save some of my adjectives. It’s been two and a half years since we visited RSNP. Unfortunately, because we were on a road trip with an itinerary crammed with OTIS fodder, because the forest was just the first stop in the giant coastline that is California, and because our speeder bikes were in the shop, we were only able to spend a few hours among the redwoods, giving short shrift to the tall trees. In fact, I’m not even sure which of the individual state parks we drove through. We were more or less following the Pacific Coast Highway at that stage of the trip, and that road cuts directly through three of the parks and closely edges the fourth. But I do vividly remember the feeling of being in that forest. That strange, glorious, discombobulating feeling. In hindsight, we should’ve cancelled the rest of the trip, went hiking, communed with nature, reverted back to our primordial state. Or, I don’t know, built a treetop village and worshipped golden gods. Anyway, we drove through some of the scenic bi-ways that traverse the forests, making frequents stops and forays into the heady woods. We hit the Avenue of the Giants, stopped at just about any grove with a name. We posed for pictures beside trunks that seemed less like the bases of trees and more like the legs of some fossilized saurian. Our eyes followed of their own accord the thick stalks straight up into a sky that seemed so much farther away than we were used to. It was almost as if, I don’t know, you could park an entire unfinished Death Star there and nobody on the ground would even notice it. Hopefully I’m getting across that visiting the redwoods was an amazing experience. 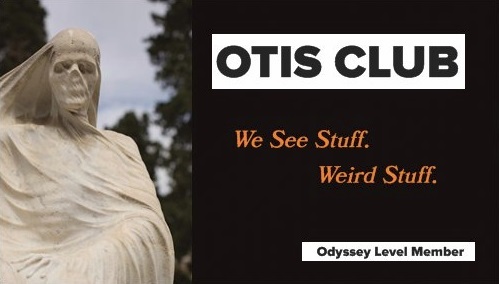 And it might be the head-warming nostalgia or the three glasses gut-warming port talking, but if you’re forced at gunpoint to do one thing on this OTIS website, do the redwoods. RSNP, feel free to use “Do the Redwoods” in your next tourist campaign. 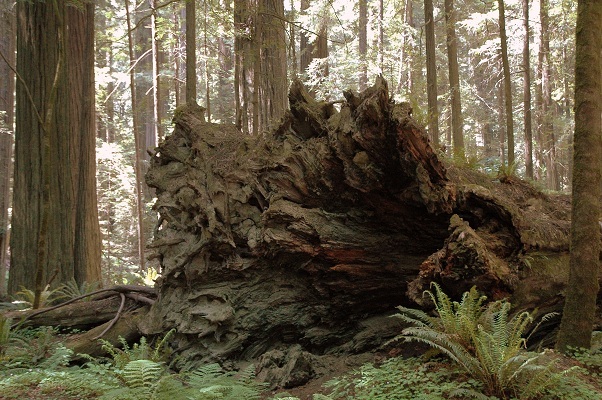 Oh, and did I mention that the arboreal final act of Return of the Jedi was filmed there?